The Energy Performance Certificate (EPC) assesses the energy performance of a property, on a “A+” to “F” scale and provides a set of improvement recommendations.This certificate is mandatory when listing a property for sales or lettings, or in the conclusion of sales or lease agreements. Get your Energy Performance Certificate with EDP, the leader in the energy certification market. 1. With an ERA office support schedule the visit to the property in less than 24 hours. 2. A qualified expert visits the property, calculates the energy performance and identifies improvement recommendations. 3. Within 72 hours, the certificate is sent by e-mail and by post alongside with recommendations for improvement. - The Real Estate contract with ERA Warranty ends for any reason. It is easier to pay the Energy Performance Certificate. Schedule the visit to the property in less than 24 hours. Energy Performance Certificate delivered in 72 hours. In properties with a valid EPC the household can find a QR code, located in the property electric panel. This QR code gives you access to the EPC sheet which provides the property energy rating and a set of cost effective improvements. The visit to the property is always carried out by an experienced qualified certifier. By certifying with EDP, your property has been certified by the leading company in the Portuguese energy certification market. Only households with ERA Warranty properties can apply for EDP Energy Performance Certificate and pay it later, in its sale (up to 12 months). 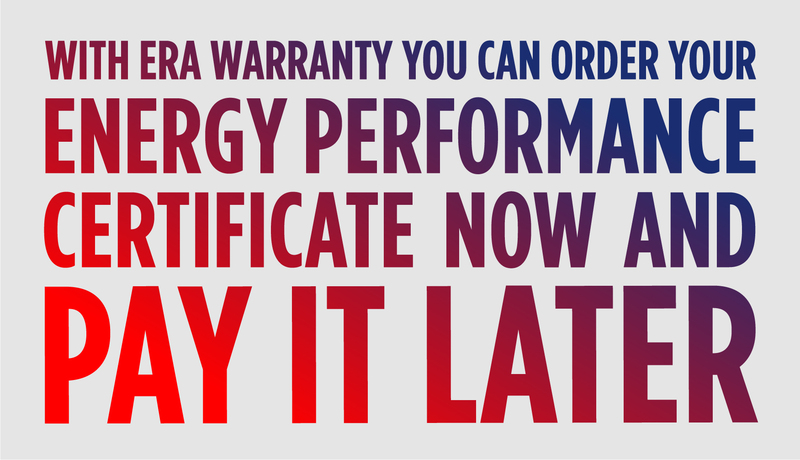 Contact your ERA Agency, order your EDP Energy Performance Certificate and pay it later. We will do everything to fulfil our mission: to sell your property. DO YOU WANT TO KNOW MORE ABOUT THE ENERGY PERFORMANCE CERTIFICATE (EPC)? I authorize ERA Portugal and ERA Offices to store my personal information in order to inform me with the latest opportunities to sell, buy or rent a property. You can change this authorization later at privacidade.era.pt. Please accept the terms of this form.